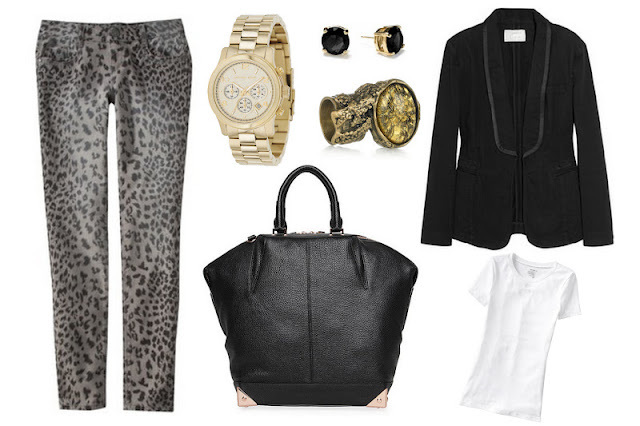 I stayed out of the Jason Wu for target craziness this past weekend, nothing really spoke to me to wait in line for. But I did have to stop by to grab some normal household items, so Monday night I made the venture and spotted something that had to come home with me. 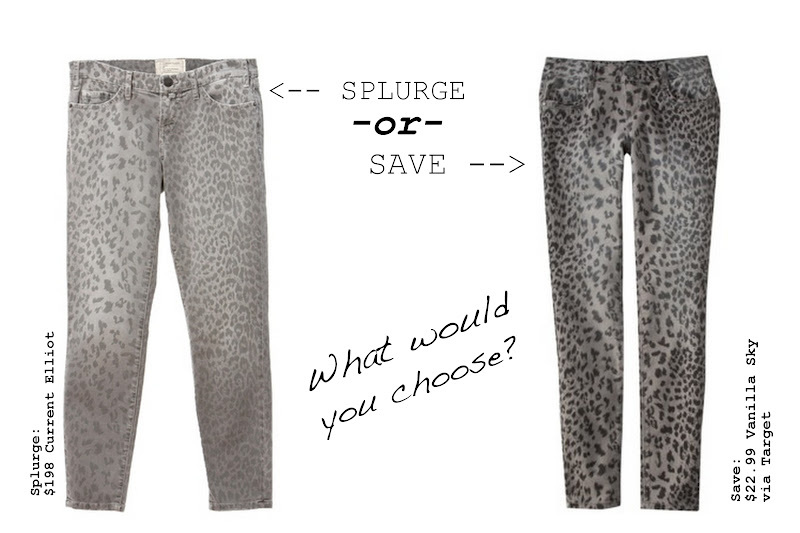 Now I beg you to answer - splurge or save? I saved, and happy to admit it! I went with the Camel Leopard although seeing the Grey Leopard above, I think I need these too! I have wanted the Current Elliot version for quite some time, I ogle them every time I'm at Saks and Nordstroms....but didn't like the price tag on the more trend driven item. And I'm not feeling an ounce of guilt for buying this knock-off cheap version....and then maybe a second pair - together for under $45 bucks! They are so fun and are much more muted in person - and really read as a neutral. Celebs have been spotted all over in them - because they are so fab! Here is one way I plan to wear them! For a fun night out - classic yet updated and fresh!!! And quite possible exactly what I'll be wearing Sat night for a little girls night out!!!! Now add a pop of color in the shoes? Red pumps, Purple pumps or Basic black? Are you going to save too?? What do you think??? oooh I likeeeee! I've been in the search for some good knock offs but haven't found any yet. I would definitely spice them up a bit with red pumps! That is such a great find!! I think you need the grey pair too! Wait, do you have that lovely Alexander Wang bag??! I love that bag and was oogling them this week at Barney's. I would go save all the way, since they are pretty darn close to the original. I didn't pick them up when I saw them in store, but I have been thinking I should go back and get myself a pair. Great find! they are adorable. Hope you are feeling better! You look amazing in those jeans! So excited to see you style them! Just picked these up as well! Great save/splurge post!! Great find my dear- love the pattern although I'm not sure I could pull them off. The outfit you put together is great. I can't thank you enough for this post. These jeans have been on my list forever, but this is the first cheaper pair that actually looks good. Buying them now!! So I love the save pair even more than the slurge! How awesome is that?! I was never a huge fan of this trend but I love the outfit you paired them with! They're actually pretty cute when paired with classics. Save! The Target ones look great in person...even better than pictured. Fabulous find! I really want a pair now. Save!! After seeing SJP wesring them with heels, I'm smitten! Great find! You were absolutely right to save! I always go with the less pricey options when it comes to trends. And I love that you already have an outfit in mind...proof that they will be worth the purchase! bravo on the save! great find, and i was JUST at target... now i have an excuse to go back! I just picked up the gray leopard last night! I love them and feel edgy-thanks! I just found your blog and love it!! Did you find that the jeans were true to size and how is the length? I always have a hard time finding less expensive awesome jeans that are long :) Thanks for blogging!!! I'll be here often! After seeing this post I ordered them and have been coming up with ways and places to wear them ever since! thanks!